Allows you to use the Hearthfire house churn at any time if you have a jug of milk to spare. No more waiting for respawns! 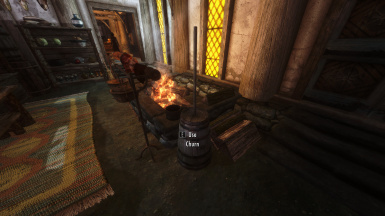 Allows you to use the Hearthfire churn at any time if you have a jug of milk to spare. No more waiting for respawns! Bethesda was really lazy with the churn, and made it a plant. So you harvest the butter and it grows back a week later, but only if you are away. Makes sense. Now, 1 jug of milk can be converted into 1 bowl of butter. Complete with immersive messages such as "You've made butter." and clanking sounds. You might have noticed that the screenshots show the churn in the Bannered Mare. Well, this is part of my upcoming mod that places ovens and churns throughout Skyrim, this mod doesn't add any new ones. Keep your eyes peeled! Use the Nexus Mod Manager to activate the file. This will install the .esp file and the script into the correct folders. However, this mod is simple enough to install manually if you wish. Remove the installed files either through the Mod Manager or, if you chose the manual way, manually. Simples. This mod will conflict with those that alter the churn in any way in the 3 Hearthfire houses, e.g. moving them around. Load this mod after those you suspect this one to conflict with. If you wish to look at the script, it is available in the optional download section. If you want to use this mod's functionality in another, PM me first. If you want to make a translation, upload on the Nexus, PM me the link.